This time we are going to make the transition from making laced and hand stitched bags, using hand tools, to making them using a commercial sewing machine. It doesn't make much difference which machine you use as long as it has a "Compound Feed". It can be a Pfaff, Juki, Consew, Adler or any of the made in China knock offs. I also like a reverse lever like on my Consew 226. I have to caution you about getting the 226 though. It has a design flaw which causes the thread to get caught under the hook all the time. It is quite aggravating and I have seen people abandon it's use because of this problem. 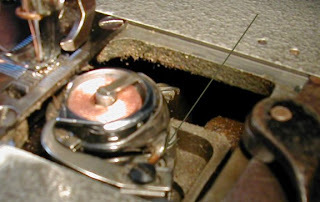 It is easily corrected by soldering a wire from the needle guard on the hook to the heel of the hook, closing off that 1/4" opening below the hook. You will need to use a liquid flux like Duzall in order to make the solder stick to the chrome hook. You probably don't know what I'm talking about, and probably wonder what that has to do with making leather goods. It sounds more like a mechanic thing. Well, that is why some people are never able to make the transition from hand sewn to machine sewn leather goods. You will have to know not only the proper way to install the needle, how to thread the machine properly, have a variety of needles for different size threads, and be able to adjust the thread tensions. You will also have to know how to adjust the timing or you are going to waste a lot of time and money trying to get someone else to do it. You are going to need a variety if presser feet and maybe even modify the stock ones for some operations. I'm not going to spend much time explaining how to make bags using only a sewing machine because what you can do is limited. You can make soft simple "Turned" bags out of thin leather, like Hobos and drawstring bags. You can make some "Stitch out" bags of firmer leather with raw edges, and garments if that is the way you want to go. You will soon find that with more complicated bags the seams get really thick in some areas, the bags get lumpy and just don't work. What you need along with the sewing machine is a skiver (sky-ver). I use Fortuna skivers but there is a good Italian make and a lot of made in china knock offs. The skiver is a strange looking machine. It has a hollow circular blade called a Bell, a curved feed wheel under the sharpened edge, and a presser foot above. 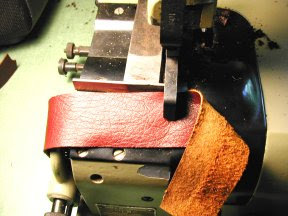 The leather edge is fed through the machine which cuts off part of the back of the leather. The flat guide determines the width of the skive and the knob below the lamp on the top picture adjusts the depth of cut. Besides learning what all the adjustment knobs on the machine do, you will also have to know the proper feed wheel and presser foot to use. 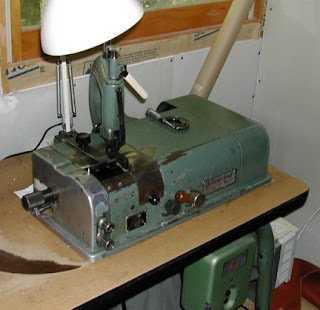 This machine can make up to a 2" wide skive which with the proper presser foot, can be used as a splitter for making binding. With these two machines you can make more complicated turned bags with pockets and turned edges like the tote handbag on my web site. You will probably have to have raw edges on the closure strap but you can make a wide piece of binding for the top edge and put it on using the "French" binding or "Stitch in the ditch" method. To make bags at this level you have to be as much of a mechanic as you are a designer or leathercrafter. To even just be a designer, you should know what the machines are capable of doing. A niche by exporting our high end products to several countries e.g. U.S, Russia, Germany & Australia etc. So nice to visit your excellent blog. You can see my website Rita’s Creation Pvt. Ltd., which is a manufacturing company of leather goods, offers leather wallets, leather purses, leather ladies hand bags, leather key case & card case, leather portfolio in Kolkata, India.